The fruit-nut-cheese salad is my go-to weekday salad. My kids started eating salad when I introduced this recipe to the dinner table. This salad with its trio of ingredients is the gateway to enjoying salads. The fruit and combination of textures make this salad irresistible. 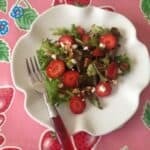 What I love is how quick and easy this salad is to make. We never get bored because we rotate the fruit selection by the season.